Chili makes for an ideal cold weather dinner. It’s my standby when I’m having friends over, not sure exactly what time we will eat, and I want to make it in advance. It’s also hard to mess up. To make it special, you can serve it with all kinds of fun toppings (avocados, sliced jalapenos, olives, etc. ), with a salad and cornbread to round it out. And it’s happy to to simmer on low heat as you wait for your guests to arrive. If you accidentally add too much chili powder, as I did, you can mellow it out by adding crumbled tortilla chips. And if an extra person or two show up, just add more beans or tomatoes or serve it over rice. 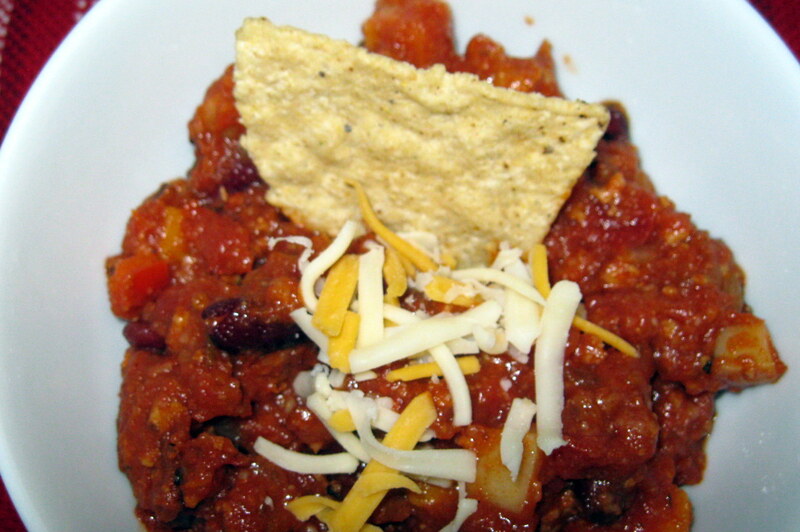 The personality of this chili is determined by the chili powder and the toppings. It’s fine with McCormick chili powder, which is very mild, and you’ll probably want to add more of it than the recipe says. For more zest and complex flavor with moderate heat, I’ve been using Penzey’s chili 9000. It has interesting ingredients such as ancho chili peppers, cocoa powder, fennel, and cardamom. Sweet potatoes play nicely against the chili powder and give this dish more substance. You can go two ways with cooking the sweet potatoes, depending on whether you are going for speed or fewer pans to wash. It’s quicker to roast the potatoes as you are cooking the chili and then add the potatoes at the end. If you are in no hurry, you can add the uncooked potatoes directly to the chili, but plan on at least 20 minutes of simmering until they are soft. 1. Preheat the oven to 375. Put 2 tsp oil on a rimmed baking sheet, add the sweet potatoes, and toss. Put into the oven, checking after 10 minutes, and tossing the potatoes. Bake until the potatoes are soft when poked with a fork, remove from the oven, and set aside. 2. While the sweet potatoes are baking, in a large soup pot, heat 1 TBS oil over medium heat and saute the onions for about 5 minutes until soft. Add the garlic and cook for 1 minute. 3. Add the turkey, stirring it into the onion mixture and breaking it up with a spoon. Cook until turkey is nearly cooked through and no longer pink. 4. Add the bell pepper, tomatoes, tomato sauce, tomato paste, 1 tsp salt, chili powder, and 1/2 cup of water. (If you are choosing the longer cooking method and not roasting the sweet potatoes, now is the time to add them.) Bring to a gentle simmer, being careful to not boil the mixture. Simmer for about 15 minutes, then add the roasted sweet potatoes, beans, and crumbled tortilla chips and simmer for 5 more minutes. Add more water if the chili is too thick, and continue to simmer until sweet potatoes are cooked through. Serve with toppings of your choice. This entry was posted in Beans and legumes, Comfort food, Healthy, Poultry and tagged turkey sweet potato chili. healthy turkey chili by Amy. Bookmark the permalink. Sounds good…my manicurist has just started Weight Watchers and is trying out new lean turkey recipes. Sounds like a good one to share with her!